Named one of fashion's top 25 most influential people by the British Fashion Council, Redken’s Global Styling Director Guido Palau was – as always - a prominent fixture in the backstage hustle of the recent New York Fashion Week, styling some of the week’s most prestigious shows. One of my favourites was the Victoria Beckham show, which always wows in terms of its signature take on totally modern elegance. 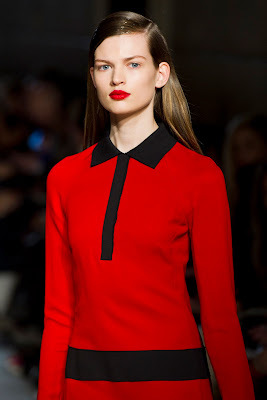 The ultimate in carefully studied chic, Victoria Beckham’s Fall/Winter 2012 show was held at the New York Public Library and featured models’ hair cut to a blunt, uniform finish that fitted perfectly with the label’s ultra-modern polished look. 1. Starting with hair trimmed very straight with a blunt finish, add Redken satinwear 02 ultimate blow-dry lotion to protect and soften hair, and blow-dry. 2. Create a deep side part and flat iron hair until perfectly straight. 3. Add a generous amount of Redken shine flash 02 glistening mist for a glossy finish, and tuck hair behind the ears.